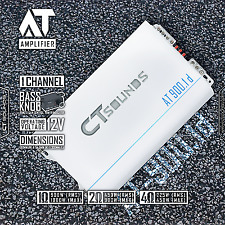 CT Sound’s T-1000.1D Monoblock Car Amplifier 1000W Amp is one of the best & powerful Class D monoblock amplifiers, which gives you perfection into your car audio gears. 1Ω @ 14.4V,1000W (RMS) | 2000W (MAX). This class-D amplifier makes sure that internal circuitry operates and sustains safely even while busy with its full load of 1800 watts (max) of power at 12.8 volts. 1Ω @ 12.8V,900W (RMS) | 1800W (MAX). 1Ω @ 12.8V,500W (RMS) | 1000W (MAX). 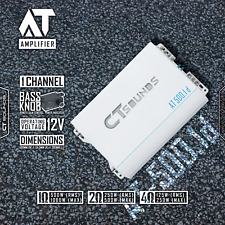 For a seamless sound solution in your vehicle,CT Sound’s AT-500.1d Monoblock Car Amplifier is one of the best car audio amplifier solution. Soft turn on circuitry. Just connect it to the power in your vehicle set it up with the speaker/sub set and you are ready to go Features: 1. 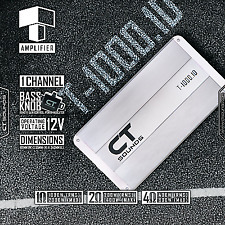 Class D Amplifier Technology 2. No of channel: 1 2. Frequency response (-3dB): 10Hz 250Hz 3. 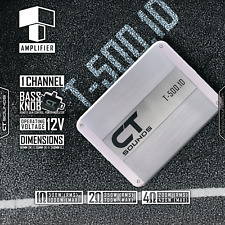 CT Sounds is proudly introducing one of its splendid car audio amplifiers- theT-500.1D Monoblock Car Amplifier 500W Amp. 1Ω @ 14.4V,500W (RMS) | 1000W (MAX). 2Ω @ 14.4V,350W (RMS) | 700W (MAX). 4Ω @ 14.4V,200W (RMS) | 400W (MAX).